Let’s forget for once monumental bronze sculptures and large permanent memorials. Let municipalities and those who fund art projects for the community get convinced that a work of public art may be small in size, humble in its presentation or, what is more amazing, ephemeral, and yet a landmark in the memory of a city. Claire Doherty, curator, editor and author of several publications on contemporary art and public space is convinced of this. Since more than a decade she’s been leading “Situations”, an organization established in Bristol (UK), which commissions and produces public art projects in England and internationally. On a recent tour in several Australian cities where she presented some of their projects, Doherty made ​​clear which are her priorities in the field of public art when at the beginning of her lecture was wondering how many gardeners and food producers were in the audience apart from the usual artists, curators, etc. And the best part is that yes there were. There are two key words in the artistic proposals curated by “Situations”: space and time. The first one, conceived from a dynamic point of view rather than a physical location that leaves a trace or addition to the landscape, invites artists to “contribute to the lived experience of a place.” Space is not the determining factor for the realization of a work, but it is one among several elements to take into account (such as the audience or certain circumstances in the life of a city). Regarding the second, the temporal component covers several aspects like the duration of the work itself, which does not necessarily have to be permanent, or the public time, that one which is built by the public itself, by the viewers with their own presence or participating in actions that will pass into the memory of the community. In short, the context acquires an essential importance as it re-imagines “place as a situation, a set of circumstances, geographical location, historical narrative, group of people or social agenda”. It is the setting in which an art project is developed and can take many forms, from installation to a collective or interactive action. Another aspect I would like to underline of this innovative approach to public art is that it not only doesn’t neglect the more conventional media such as sculpture or installation but promotes them giving a twist to the traditional way of presenting them. This is especially clear in the appealing event that took place in different cities of New Zealand during one year between 2008 and 2009. “One Day sculpture” invited 23 artists to make public interventions only during 24 hours. Particularly important in this approach was the questioning of public sculpture in terms of permanence and monumentality, and propose new definitions that include aspects such as criticism, space, performativity and intervention. 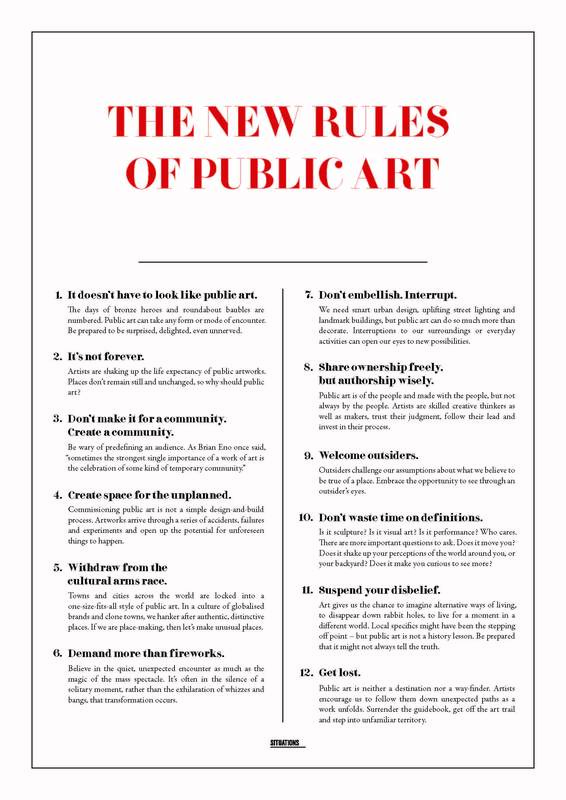 The New Rules of Public Art, 2013. Photo: Situations. Projects driven by “Situations” disrupt the status quo, impelling the commissioners to seek alternatives to conventional public art. In parallel, they develop an equally important theoretical, pedagogical and critical work, organizing workshops, surveys and public research processes as well as evaluation reports of the projects. Apart from publications there is also a complete website where you can find comprehensive information on each project as well as “commissioned responses” by different authors. One of the last works in which they are embedded is a research led by the Psychosocial Research Unit at the University of Centre Lancashire that explores public responses and associations with two recent, and very different, public artworks that have been in the town of Ilfracombe in 2012: Damien Hirst’s “Verity,” a permanent artwork, and the aforementioned “Nowhereisland”, which visited the town in September 2012. We are very curious about the result.